I read this article and found it very interesting, thought it might be something for you. The article is called Periodontal Disease and is located at https://www.dencaresmilecenter.com/periodontics/periodontal-disease/. 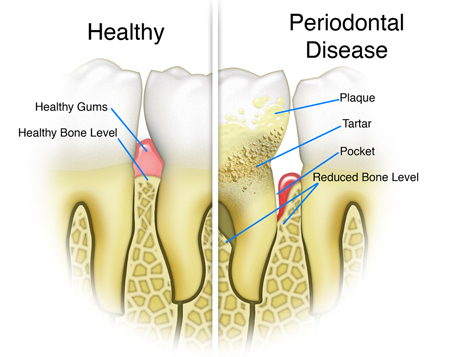 Periodontal disease, also known as gum disease, is an infection of the gum tissue that holds teeth in place. It is one of the main causes of tooth loss in adults. Since gum disease is generally painless, oftentimes it will not be noticed by patients. This disease usually begins with a condition known as gingivitis; a bacterial infection that affects the gum tissue. This can be a serious problem because once this infection has taken hold in your mouth, bone loss could be experienced, as well as tooth decay and ultimately tooth loss. 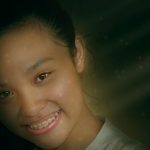 In severe cases, gums may visibly recede as well, with the root of the tooth becoming exposed. Periodontal disease is caused by plaque, a sticky film of bacteria that constantly forms on the teeth. This bacteria create toxins that can damage the gums. Periodontal disease attacks just below the gum line causing the breakdown of the supporting tissues. Because the bone loss is often not visible, it is vital to visit your dentist for regular checkups to ensure that your oral health is on track. Regular cleanings are the best prevention for this type of disease. 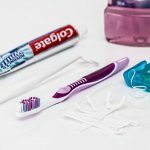 However, there are some warning signs that you might keep an eye out for at home, including, sensitive, swollen, or red gums, and bleeding when you brush your teeth. Halitosis (bad breath) has a number of causes but it may also be a sign of gum disease. Also, if your teeth feel as though they are becoming loose, contact your dentist immediately, for this could be another indicator of gum disease. Diseases such as diabetes may also play a role, and medications that are used to treat other conditions could impact the gums as well. Because there are so many different factors that contribute to periodontal disease and its causes, it’s best to consult with your dentist to learn more about what you can do to prevent it. In most cases, early detection is the best treatment for this periodontic condition. Your dentist or hygienist can perform deep cleanings that go below the surface of the gums, helping to prevent gum recession and protecting the bone from harmful bacteria that could accumulate in the loose pockets of gum tissue.